6 July [O.S. 24 June] 1887 – 28 March 1985) was a Russian-French artist.Art critic Robert Hughes referred to Chagall as “the quintessential Jewish artist of the twentieth century” (though Chagall saw his work as “not the dream of one people but of all humanity”). An early modernist, he was associated with several major artistic styles and created works in virtually every artistic medium, including painting, book illustrations, stained glass, stage sets, ceramic, tapestries and fine art prints. According to art historian Michael J. Lewis, Chagall was considered to be “the last survivor of the first generation of European modernists”. For decades, he “had also been respected as the world’s preeminent Jewish artist”. Using the medium of stained glass, he produced windows for the cathedrals of Reims and Metz, windows for the UN, and the Jerusalem Windows in Israel. He also did large-scale paintings, including part of the ceiling of the Paris Opéra. Before World War I, he traveled between St. Petersburg, Paris, and Berlin. During this period he created his own mixture and style of modern art based on his idea of Eastern European Jewish folk culture. He spent the wartime years in Soviet Belarus, becoming one of the country’s most distinguished artists and a member of the modernist avant-garde, founding the Vitebsk Arts College before leaving again for Paris in 1922. He had two basic reputations, writes Lewis: as a pioneer of modernism and as a major Jewish artist. He experienced modernism’s “golden age” in Paris, where “he synthesized the art forms of Cubism, Symbolism, and Fauvism, and the influence of Fauvism gave rise to Surrealism”. Yet throughout these phases of his style “he remained most emphatically a Jewish artist, whose work was one long dreamy reverie of life in his native village of Vitebsk.””When Matisse dies,” Pablo Picasso remarked in the 1950s, “Chagall will be the only painter left who understands what colour really is”. 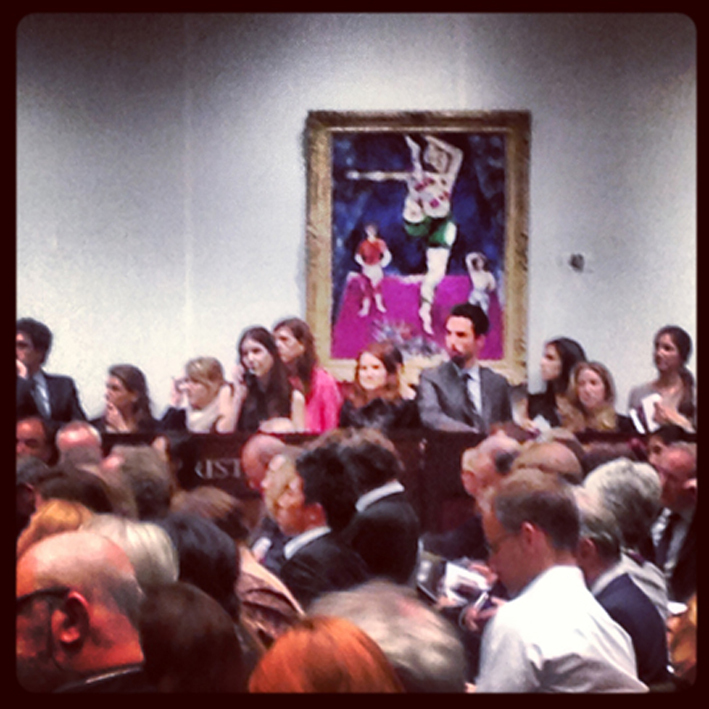 when “Les trois acrobates” (1926) sold for USD 11,500,000; well above the estimate between USD 6,000,000 – 9,000,000. 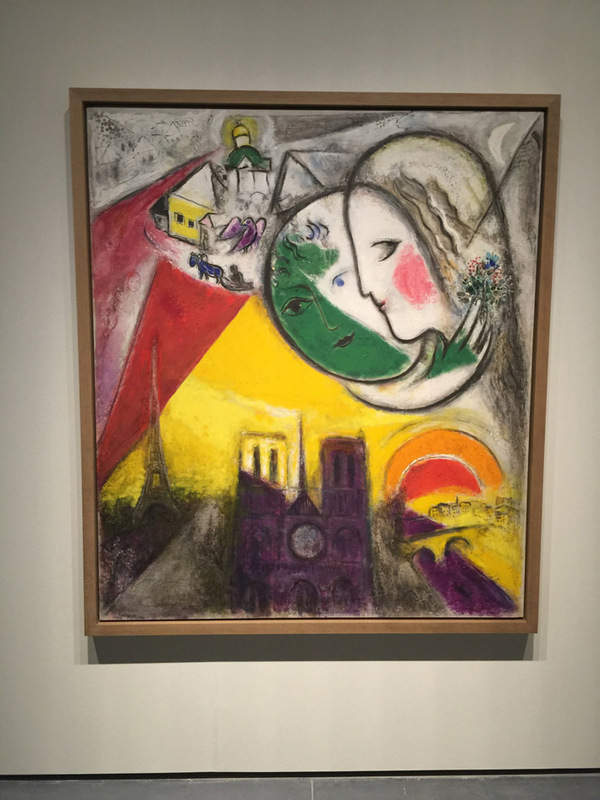 An artwork by Modernist master Marc Chagall became the most expensive contemporary Western painting sold in Asia when it was auctioned for $4.18 million after steady bidding in a Hong Kong sale. 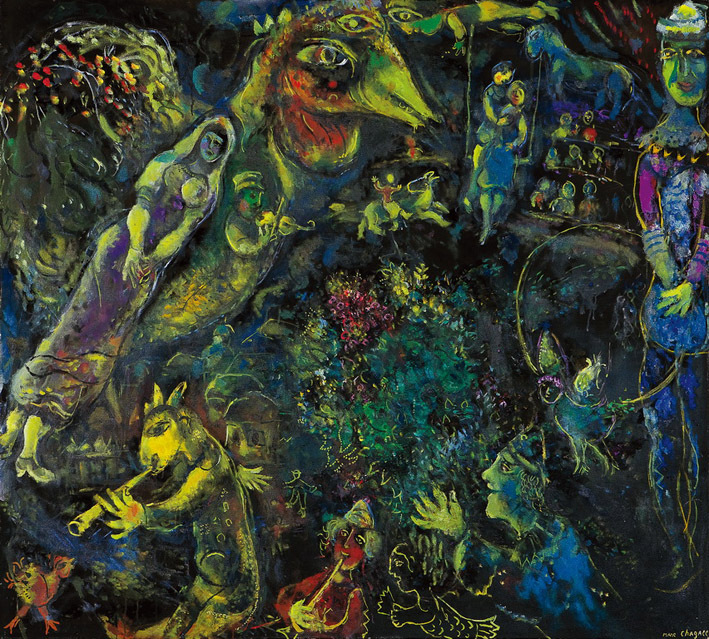 Auction house Seoul Auction sold “Bestiaire et Musique,” a 1969 oil painting typical of Chagall’s whimsical style, to an unidentified Asian buyer. The auctioneers said the work set a new record in a region increasingly wielding more influence in the global art market. Les Affiches de Chagall / Sorlier, Charles. Paris: 1975. The catalogue raisonné of Chagall’s posters. Marc Chagall. The Illustrated Books: Catalogue raisonne / Cramer, Patrick. Preface by Meret Meyer. Geneva. 1995. The Lithographs of Marc Chagall / Cain, J., Sorlier, C. & Mourlot. Monte Carlo & NY, 1960-1984, 6 volumes: Volume 1, to 1957, Volume 2, 1957-62, Volume 3, 1962-68, Volume 4, 1969-73, Volume 5, 1974-79, Volume 6, 1980-85. Do you wish to buy or sell a Marc Chagall painting, then please contact me.I have a few good oil paintings for sale. The Great Parade, 1979–1980, Pierre Matisse Gallery, New York. Chagall for sale, Do you wish to buy or sell a Marc Chagall painting, sell Chagall, then please contact me.I have a few good oil paintings for sale.